Now tell me is that nasty girl you? You know how it is for the ex-pat: the lights of the bars in Shinjuku’s Golden Gai used to titillate, but one tires of drag queens and vomiting up shochu and yakitori at 3 a.m. You move on to ukiyo-e at the Ota Memorial Museum of Art near Harajuku, but too soon you need more than 100 views of Fuji to get off. You soak your sore nether regions in the sento (bathhouses) of Ryogoku, and ritually wash yourself pure at the shrines of Kamakura. You have a brief fling with the Snow White looks of Kokkai, the Georgian sumo wrestler, who, incidentally, mixes a really tasty mint julep, but even his bulk can’t wear down your need for more more more. You have worked over the Kanto Plain and now your jaded palate wants a taste of the Kansai, the famous Heian kink. Like Genji looking for a hookup with an anonymous handmaid with blackened teeth and a stiff…raw…silk kimono, everyone eventually ends up stumbling blind with desire into Kyoto. 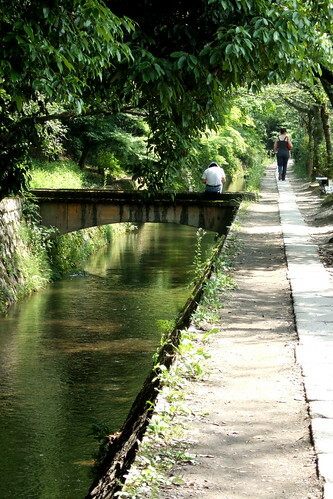 Photo: Philosopher’s Walk, a famous canalside path, named after Kitaro Nishida (1870–1945), a philosophy professor at the University of Kyoto, who would meditate as he walked along it. First stop: the so-called “Philosopher’s Walk,” a tree-lined, watery test of stamina, with many temptations, secret places, and mind-blowing meanings. We worked that hidden canal for hours, until we had to collapse, exhausted, at Honen-in, a mossy and wet Buddhist love motel. 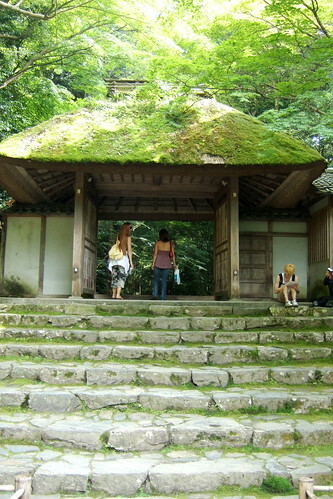 Photo: Honen-in Temple, a stop along the Philosopher’s Walk. We sprawled on the cool, slick wooden veranda of the prayer hall with a group of strangers, disreputable-looking middle-aged Japanese sybarites carrying guidebooks and open minds—all of us sweaty and shoeless. It was a place that smelled of the incense of love. Under the stony gaze of The Buddha Who Likes to Watch, we collapsed in a lusty heap, trying to keep our voices low and our hands off each other. We failed. 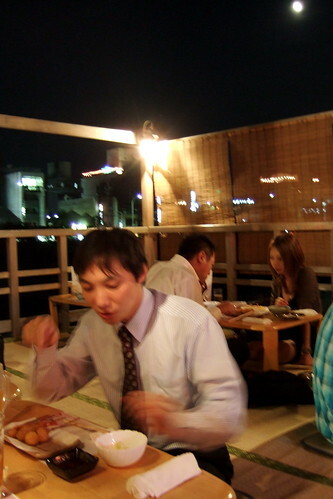 Photo: The yuka (summertime riverside veranda) of Fujino-ya, a tempura and kushi-katsu (deep-fried kabobs) restaurant on Pontocho. My posse and I were sitting outside on Fujino-ya’s yuka, one of the salacious summertime riverside verandas, marveling at the colorful fashions worn by the hustlers and dealers of the Kyoto underworld. The “English” menu said, “Raw Japanese alcohol,” so we knew we were in the right place. When the waitress brought an unpasteurized sake and some hot meat rods, we began our descent into the dangerous world of the Pontocho. The night was our fried oyster…. 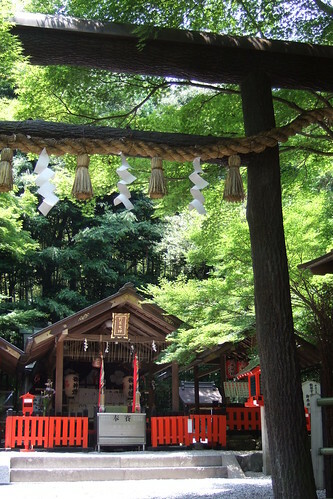 Photo: Nonomiya Shrine, a Heian-era shrine where imperial princesses would purify themselves. The evening moon burst forth and the figure she saw in its light was handsome beyond describing. Not wishing to apologize for all the weeks of neglect, he pushed a branch of the sacred tree in under the blinds. 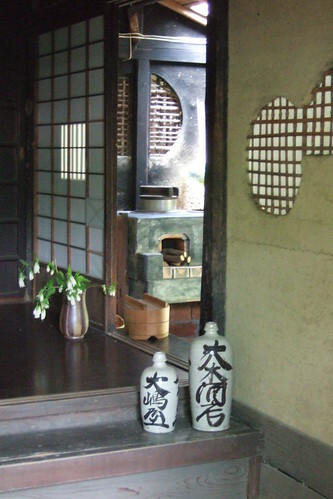 Photo: Rakushisha, the home of Mukai Kyorai (1651–1704). 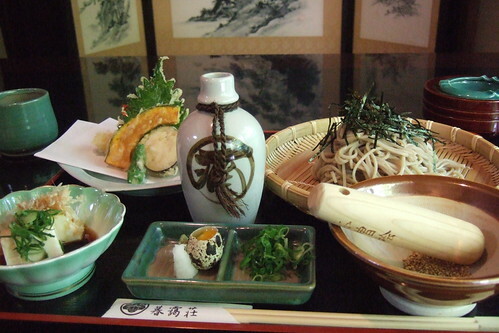 Photo: Lunch at Boai-so, a Kyo-ryori restaurant, located in Arashiyama. I’d heard about a place called Boai-so (the grinding stick), which sounded good and nasty. Boai-so is a farmhouse once owned by Kitaro Nishida (he of the Philosopher’s Walk) hidden in a grove of rock hard, gently swaying bamboo. The house madam recommended the daily special, a multi-course tease of humiliation and fresh creamy tofu. Unfortunately, I blacked out with pleasure, but you can imagine what happens when you mix a grinding stick, a suribachi full of sesame seeds, and a basket of limp, cold noodles. Worth a visit. Photo: Local Kyoto sake, Fu-ou (rich old man) junmai ginjo. 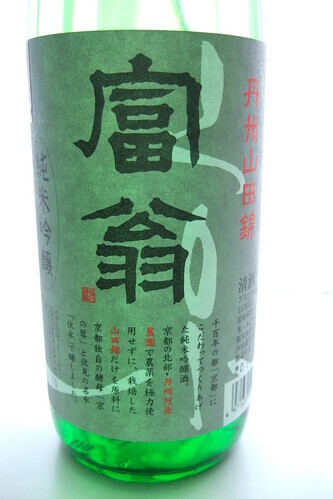 Smooth, balanced, delicious, with the typical soft flavor profile of a Kyoto sake. Later, I hit the famous meat (fish, pickles, salty things) market of Nishiki. I took my time looking at the temptations and taking saucy photos. At a shop selling booze, I picked up a local and took him back to the hotel. My posse and I had him in our room. He was a rich old man with a gentle finish, a very quaffable dude. 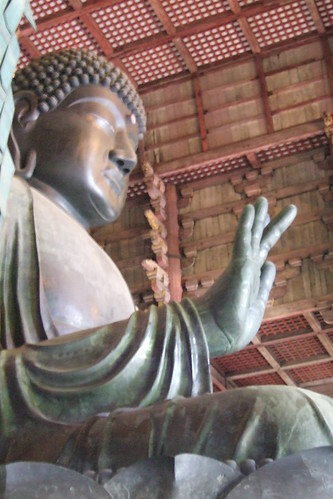 Photo: Great Buddha at Todaiji in Nara. Of course, we had to high-tail it down to Nara for the famous “deer park” show. It’s better than a “soapy” in Bangkok: all antlers and spotted flanks and girls/boys in school uniforms. Nara is known for its citizenry’s rebellious streak and phallic pickles. We lit a candle at the iconoclastic, Lenny Bruce-inspired “Big Buddha”: shown above giving The Man the finger. Photo: Todaiji temple. It is said that a person who crawls through the hole in this wooden pillar will achieve enlightenment. Inside Todaiji, an excitable gang waited their turn at the enlightenment hole. Need I say more? Photo: Local schoolgirls at the Kasuga Shrine asking to speak English with tourists as a homework assignment. 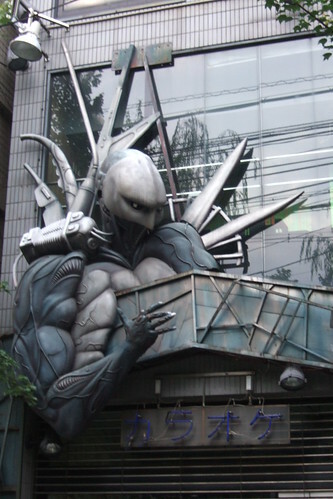 Photo: Karaoke on Kiyamichi street. Give in to the dark side, give in to Kyoto.